I’m sorry that the blog wasn’t reachable this morning, my web provider had some technical issues. It’s fixed now and the food is back! 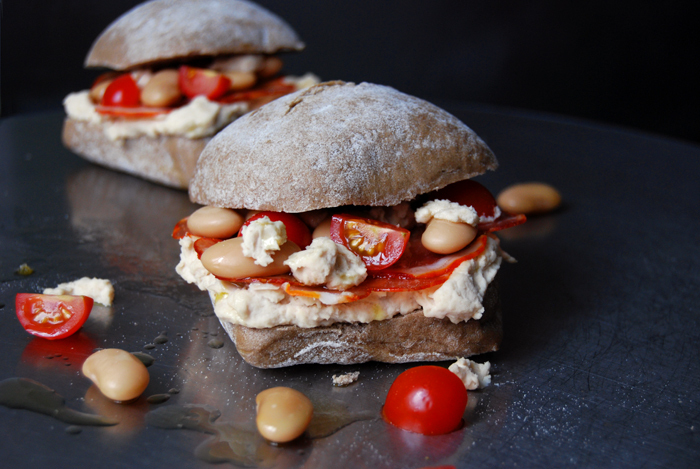 My first hummus sandwich was a luscious recipe which our Godchild’s father passed on to me. Last year Guy introduced me to the amazing Sabih, a popular snack from Israel where he grew up. 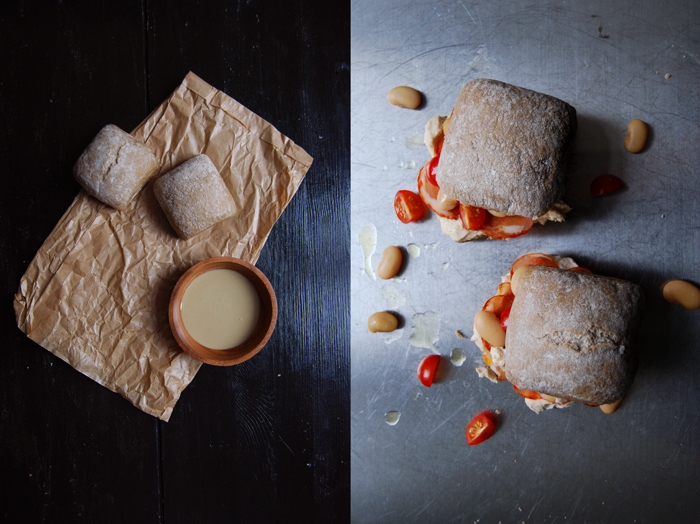 It combines velvety hummus, grilled aubergine and hard boiled eggs packed between two slices of juicy bread. It’s the kind of sandwich which makes you lick your fingers afterwards as you don’t want to miss out on the tiniest crumb. 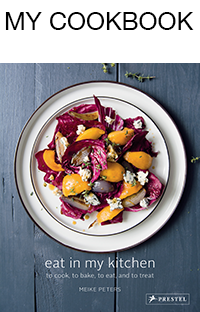 Shockingly enough, it’s been a year since I wrote about it and it’s time to play around with some hummus variations. It can’t just be chickpeas, big white beans puréed with tahini paste, fresh garlic and lemon juice create an equally delicious dip, maybe a bit softer so you have to go easy on the tahini as it can easily be too overpowering. 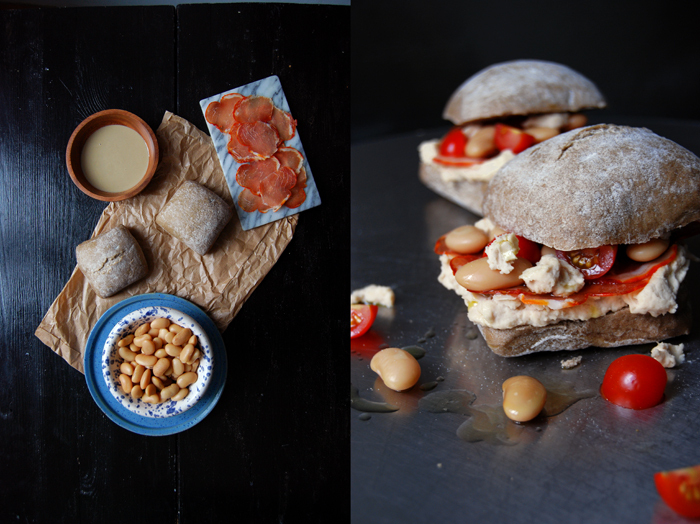 Although I had decided to go for white bean hummus for my new Sandwich Wednesday creation I wasn’t sure about the further additions until my aunt Ursula asked me if I would be interested in some of her party leftovers. She’s a gourmet, so I never refuse whatever she brings to my kitchen! 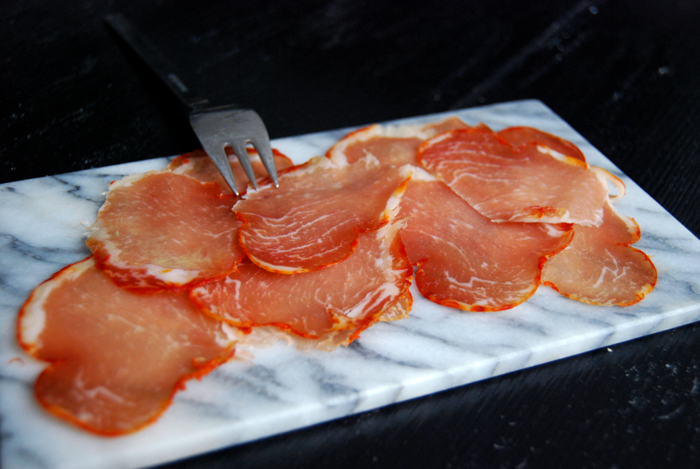 She came with a plate of the finest Serrano and Lomo (meaning pork loin in Spanish) prosciutto, both of extraordinary quality. 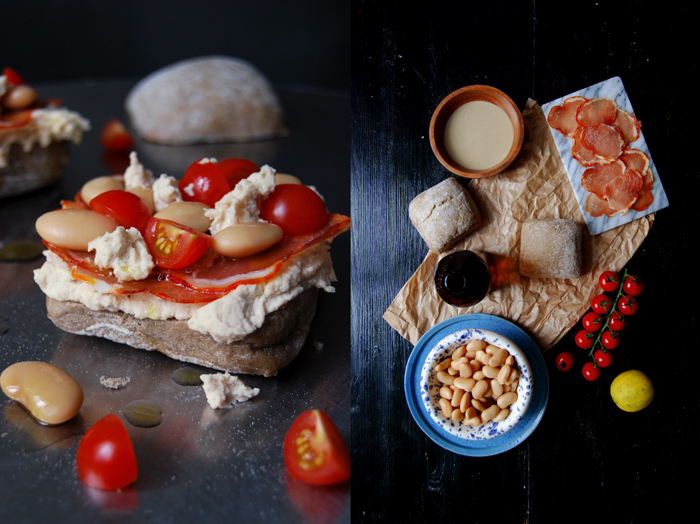 I chose the Lomo for the sandwich as it had the perfect balance of an expressive character without dominating the other ingredients. 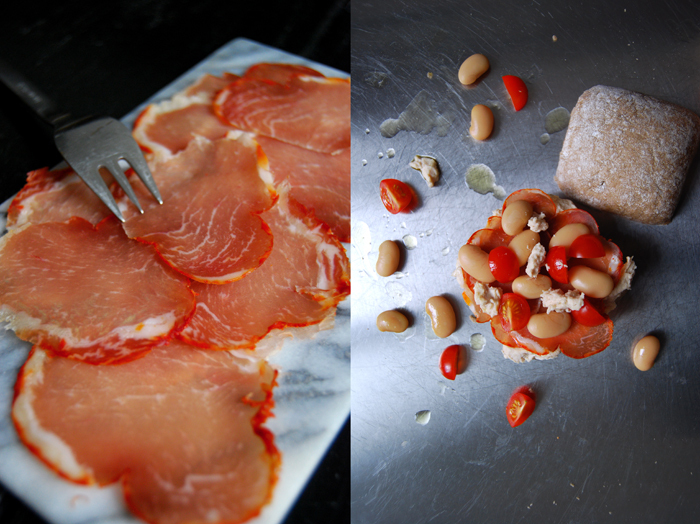 The Spanish delicacy merged perfectly with the white bean flavour, I just added some cherry tomatoes for a bit of freshness, another one of my aunt’s culinary gifts. Purée 200g (3.5 ounces) of the beans with the tahini, garlic, lemon juice, water and salt in a blender. Season to taste, add more water if the mixture is too dry. 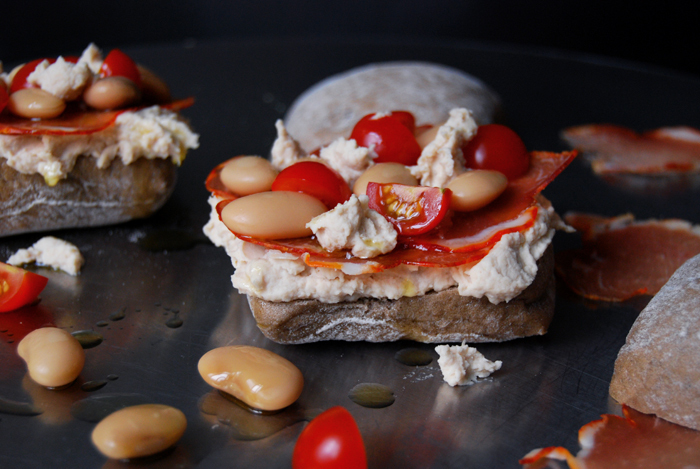 Spread the bean hummus voluptuously on the bottom half of each bun and arrange the prosciutto, the remaining beans and tomatoes on top. Sprinkle with a little olive oil, close the bun and enjoy! 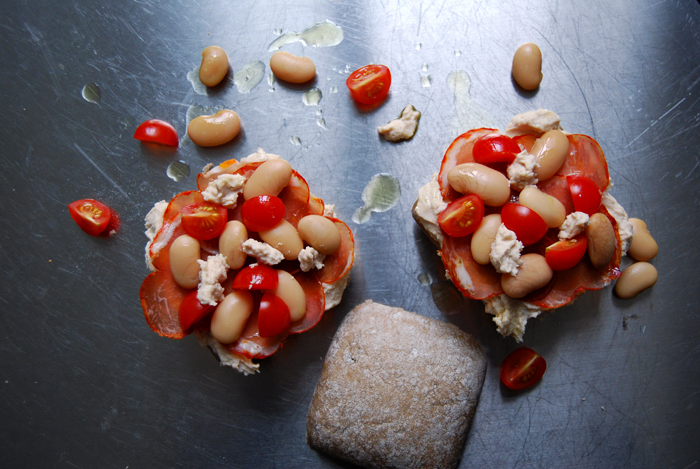 Beans, prosciutto and tomatoes make a great combo…piled onto that beautiful bread, who wouldn’t like it. Have a great week, Meike.